Sunday school children in the Methodist Church of Haiti need lesson materials, which are being developed by missionary Sharon Harbottle. 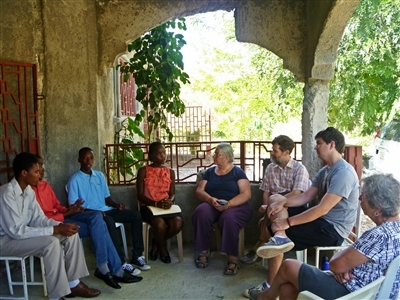 Photo from the Christian Education and Evangelism ministry in Haiti. Sharon Harbottle, center, with her husband, John, to her left, meet with vistors and native young adult leaders in Cange. Photo from Rev. Beth Bostrom. 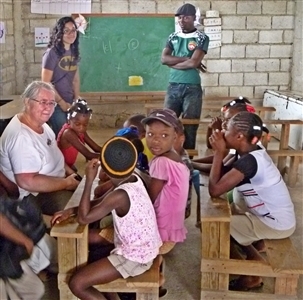 Sharon Harbottle, left, listens to schoolchildren in Haiti as Ruth Gomez, left background, of the FIU-MDC Wesley Foundation mission team looks on. Photo from Rev. Beth Bostrom. Today’s Methodist missionaries to Haiti arrive by plane and carry access to God’s word in their smartphones, but in many ways the mission field has changed little since the first Wesleyan preachers from England stepped on the island about 200 years ago. Poverty, language barriers, scarcity of resources and logistical challenges greet modern-day evangelists like Sharon Harbottle and her husband, Dr. John Harbottle, of the Methodist Church of Great Britain. Now two years into a three-year stint in Haiti, the two shared their experiences with listeners at the Florida United Methodist Center in Lakeland last week. The Florida Conference has had a covenant relationship with the Methodist Church of Haiti since 2006. In addition, many Florida congregations last year helped address the nutrition needs of that impoverished country by participating in Stop Hunger Now food packaging events. But food is not the only critical need for the people of Haiti. She is a former high school teacher and lay preacher with a degree in theology who has been developing Christian curricula for adults and children in Haiti. Her husband, a physician, has been working to organize the efforts of a network of 11 Methodist-affiliated clinics in Haiti, eight of which are currently operational. Keeping the facilities supplied with the appropriate medications and staff for each community being served has been a challenge, he said. This past summer, the Florida Conference Institute of Preaching answered a call for help in training local Methodist pastors in Haiti, partnering with Sharon’s ministry and United Methodist Volunteers in Mission. The result was a two-day preaching seminar led by Dr. Ed Phillips from Emory University’s Candler School of Theology and Rev. Courtney Smith, a church pastor and Candler graduate. The institute team traveled to Petit-Goave, Haiti, about 40 miles southwest of Port-au-Prince, expecting to coach about 75 pastors. Instead, they found more than 90, some of whom drove up to eight hours to attend. Both Sharon and Rev. Pam Carter, a veteran of missions to Haiti, were touched by the appreciation shown by the preachers who attended. “We were amazed at how overcome the preachers were with emotion,” Sharon said. “You would have thought it was Christmas when they were given their certificates” for completing the training, Carter said. In addition to instruction and individual critiques of sermon delivery, the pastors received resources translated into their native Creole language and gift bags of toiletries and bookmarks. Two more seminars are planned for January in Port-au-Prince, targeting another 175 pastors. Even after that, less than half the approximately 600 preachers active in Haiti’s Methodist Church will have received the training. Most church pastors in Haiti come from the ranks of laity, Sharon explained. Only 15 of the country’s 230 Methodist churches are shepherded by ordained clergy. Pastors often have few written resources to help in sermon preparation, and they must contend with frequent power outages as they craft and practice their presentations. The Harbottles’ ministry includes a printing press, which cuts down on production costs for the specialized training materials Sharon produces, but there are still significant expenses. In addition to the Institute of Preaching program, she also has written two Sunday school books for teachers and is working on books for children and youth. Dr. John Harbottle works with Haitian nurses at one of the Methodist-affiliated clinics to improve operations and ensure health care for the community. Photo from John and Sharon Harbottle. For information on this ministry, click here. Revs. Paul Massingill, Wesley Foundation director at Florida International University and Miami-Dade College, and Beth Bostrom, campus chaplain and Wesley director at the University of Miami, have taken student mission teams to Haiti, where they observed the Harbottles in action. Both pastors said they were impressed with the Harbottles’ skill and enthusiasm for coaching local Methodists in leadership skills that will help them address needs in the surrounding community once the missionaries are gone. In addition to helping with Christian education, Sharon works with local church leaders on such duties as stewardship reports. John works with nurses and clinic administrators to improve budgeting, inventory and operations methods so that the facilities can continue to serve local healthcare needs. “John and Sharon made a really strong impression (on visiting students) as to what it means to respond to a call,” Massingill said, adding that students from Florida typically are struck by the dramatically different living conditions of people inhabiting a place so close to their home state. “It’s always very eye-opening for the students to go and spend some time there,” Massingill said. Bostrom said she has taken two mission teams of students to Haiti, where they spent most of their time in the village of Cange. There they visited a hospital and met with young adults who organized a program that offers educational enrichment in art, music and sports to about 100 young people in the community. In January, the Harbottles joined the group to hear from the young Haitians in charge how they determined the need and built the ministry. Bostrom said they were interested in ideas to motivate others toward leadership roles in Haiti. The Harbottles expect to return to England in May and report to church leaders there. They hope to extend their mission work in Haiti after that. Click here to read about Sharon Harbottle's work with Christian Education and Evangelism in Haiti and how you can help. 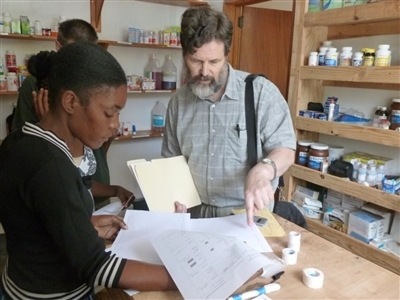 Click here to read about Dr. John Harbottle's work with the Haiti Health Program and how you can help. 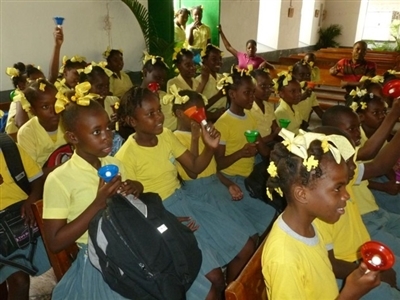 Click here to read a United Methodist Volunteers in Mission report on the Harbottles' ministry in Haiti.